2010 Season Openner an Inspiring Success! The heads of the League and players listen on as Mr. Elliston Greenslade gives a great speech to inspire and prepare everyone for the season. During the Service the President of Freedom Farm Baseball League Greg Burrows handed out awards to the coaches in their respective divisions. You can see these pictures in our Gallery Section. Also, if you have any pictures that you think are nice then please submit them to info@freedomfarmbaseball.com and we'll try and get them up ASAP. The same goes for video! We'd love to see some action videos. Congratulations goes out to all of the Freedom Farm Baseball League 2014 pennent winners. Church service at Holy Cross Anglican Church. Service begins at 8:00am. Opening ceremony will be continue at 10:30 at the Farm. The first games of the season will begin on all fields at 11:30 am. Congratulations goes out to all of the Freedom Farm Baseball League 2013 division winners. Congratulations goes out to all of the Freedom Farm Baseball League 2013 pennent winners. Congratulations goes out to all of the winners of Freedom Farm Baseball League 2013 Jamboree. All players will be advised by their coaches which team they have been placed on. Congratulations goes out to all of the winners of Freedom Farm 2012 Baseball League. Congratulations goes out to all of the pennent winners of Freedom Farm 2012 Baseball League. Congratulations goes out to all of the winners of Freedom Farm Baseball League 2012 Jamboree. helping them to excel through education and sports to become the leaders of tomorrow. will need to prepare for the draft for our players that are going to new teams. 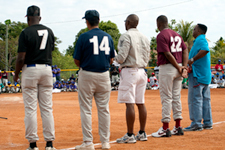 Congratulations goes out to all of the winners of Freedom Farm 2011 Baseball League. This is a reminder the cook out scheduled for June 18th from 12 noon to 6 pm is upon us. Congratulations goes out to OF: Shaquille Rolle, American Heritage, Jr.
Congratulations goes out to all of the FF nominees for the Bahamas Primary School Student of the Year Foundation 2011. Registration form for the Freedom Farm Baseball summer camp is now available on the site in the Registration Form section. Parents can downloadand and print the attached form. All players should wear their uniform shirt and hat with jeans for the march except for the teams that will be playing, as well as all coaches playing in the Coaches Game. All players should be on time so that everything will flow smoothly. Freedom Farm Baseball League opening day ceremony for the new season will be held on Saturday, January 29, 2011. Additional details will follow later. 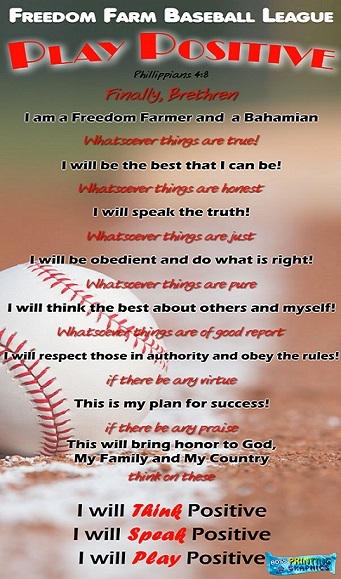 The complete schedule for the Freedom Farm Baseball League 2011 season is now available on this site in the schedule section. Enter each division to see its complete schedule for the year. Freedom Farm draft for the 2011 season is now completed. You can see the team that you were selected to by going to The Teams & Players section of this website. Each player would be contacted by their Coach, who will be preparing them for the upcoming season. Freedom Farm Baseball League has already begun registration for the upcoming season and will continue every Saturday from 10 am to 12 noon until October 9th, 2010. The league is open to both boys and girls ages 4 through 18. The league is located off Yamacraw Rd on the corner of Yamacraw Beach Drive. The registration costs is $85/player which includes full utilization of the fields, placement on a team as well as uniform shirt, hat and pants. Each child is expected to bring their own gloves. Registration forms are available at the field or can be retrieved from our website. The various divisions include T-ball ages 4-6, machine pitch ages 7-8, minor division ages 9-10, major division ages 11-12, junior division ages 13-15 and senior divisions ages 16-18. The league has a showcase and draft that begins on Saturday October 16th, where each child will be seen, then selected to be placed on a team in their respective age groups. At that point they will be assigned team coaches who will work with them and prepare them for the regular season that begins Saturday January 8th, 2011. A schedule of games will be given before then. All interested persons must register as early as possible as space is limited and we are expecting a high volume of registered players. Freedom Farm 12 under team defeated visalia, Ca in the Cal Ripken Babe Ruth 11-12 World Series Championship 7-1. The 11-12 team is the new 2010 World Series Champions. Great job Coach Greg Jr, Coach Cox and the entire 11-12 team. Freedom Farm 12 under team defeated Dundee, Florida in the Babe Ruth Cal Ripken 11-12 Southeast Regional Championship this morning 3-2. The 11-12 team is the new 2010 Southeast Regional Champions which qualifies the team to the World Series in Wilson County, North Carolina August 12th- 19th where the other nine regional champions await. Great job Coach Greg Jr, Coach Tameko and Coach Robert and the entire 11-12 team.